At Games2win we take Game Icons seriously. Errr… a bit too seriously. Our UI team’s core mandate is to try experimenting with Game Icons, Game Screen Shots, Game size continually & get downloads to increase. Because we DO NOT advertise or acquire users, the responsibility for the Analytics and UI team is extra special! 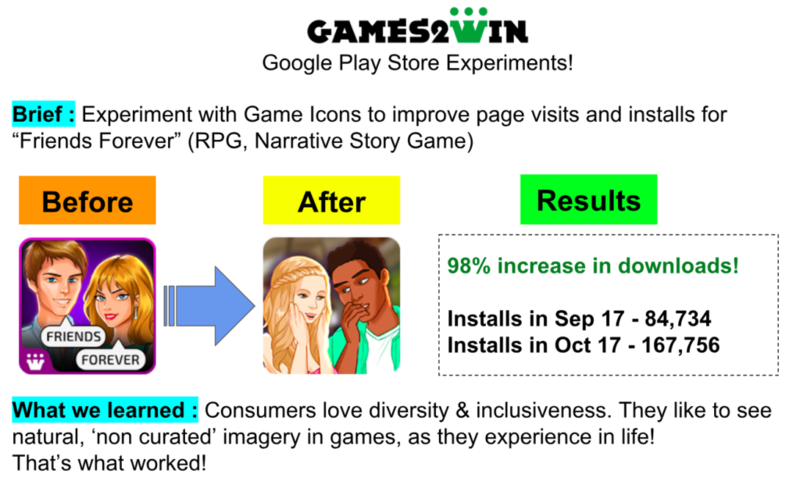 When we launched “Friends Forever” (Our 1st narrative Story Game on the Google Play Store ), we used a generic ‘good looking’ icon for the game. The game had a good response & we kept updating the game while happily ignoring the icon. A point came when the game maxed out at 2-3k downloads a day. We had hit a ‘download dead end’. The UI team kicked in & analyzed the icon. Why were showing a ‘plasticky’, ‘white’, ‘artificial’ image they asked me & the PM? We had no answer! Then, they turned the icon into a natural, comfortable, real-life image incorporating diversity & inclusiveness. The funny thing is – we had all these characters in the game but didn’t expose them on the icon! The results are on the picture to see. The lesson is immortal at Games2win.